Let your voice ring at the Big Sing! Conspirare’s acclaimed artistic director Craig Hella Johnson leads the gathering in vocal warm-ups and short, melodic songs that can be easily learned. As musical hosts, Conspirare Symphonic Choir members sit among the audience to sing along and provide musical support and encouragement during the one-hour event. 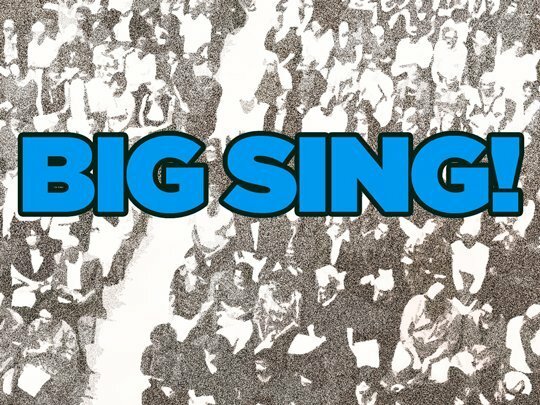 The Big Sing is open to all, regardless of musical training and experience. Through a fun, no-pressure group singing experience, audience members learn basic vocal technique, experience the body as an instrument, and sing as one with hundreds of others. Musical selections at past Big Sings have ranged from popular rounds to the Hallelujah Chorus from Handel’s Messiah to the Conspirare classic “Requiem” by Eliza Gilkyson. Johnson hand picks songs to delight, thrill, and sometimes challenge the singing audience, always with remarkably beautiful and inspirational results. Pictures by Conspirare House Manager Nicki Turman from the Holiday Big Sing 2 on 12.18.12 at St. Martin’s. Click to view.